Bryan Diaz crosses home after his third inning home run gave Big Train a lead. Diaz was making his first start since June 9 after struggling with a shoulder injury. In a wild, back and forth game in southeast D.C., Big Train (16-2) pulled out a 10-5 win over the D.C. Grays (8-12) on Wednesday night. The action began in the top of the first at the Washington Nationals Youth Baseball Academy, when Bethesda centerfielder Tyler Villaroman (San Francisco) hit a solo home run to hand Big Train an initial lead. D.C. responded with a run in the bottom of the inning, but Big Train starter Carter Bach (Wake Forest) managed to strand three Grays runners by striking out three of the last four hitters. 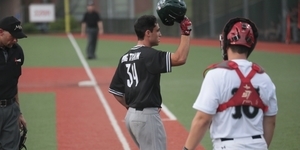 After a scoreless second, rightfielder Bryan Diaz (Nova Southeastern), in his first start since returning from a shoulder injury that had sidelined him for multiple weeks, smacked another home run to reinstate the one-run advantage. After the next three batters loaded the bases, RBI sacrifice flies from first baseman Alec Burleson (East Carolina) and third baseman Carson Taylor (Virginia Tech) scored two more runs. The Grays struck back immediately. After two walks to start the bottom of the third, designated hitter Jahleel Sewer hit a three-run shot to tie the game, chasing Bach from the game in the process. While Parker kept the D.C. offense in check, Big Train tied the game back up at five thanks to a Justin Wylie (Arizona) home run in the fifth. Bethesda would finally break into the lead for good in the top of the eighth. With runners on first and second, shortstop Fox Semones (James Madison) ripped a two-run triple for what would be the game’s winning runs. With the win, Bethesda keeps its place atop the Cal Ripken League South Division, while the Grays remain in fourth place. Big Train will return to action at Povich Field on Thursday night at Povich Field against the Loudoun Riverdogs.